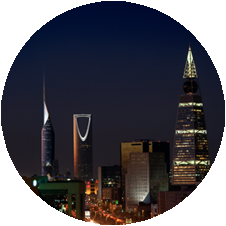 Riyadh, Saudi Arabia is a part of the Logistics Plus® network. This office provides air and ocean freight forwarding, inland ground and rail, warehousing and distribution, project cargo, import/export, and global trade compliance services. It is also the capital of Riyadh Province, and belongs to the historical regions of Najd and Al-Yamama. It is situated in the center of the Arabian Peninsula on a large plateau, and is home to 5.7 million people, and the urban centre of a region with a population of close to 7.3 million people. Riyadh has the largest all female university in the world, the Princess Nora bint Abdulrahman University. Riyadh is also home to a Logistics Plus office where we proudly serve both small and large businesses throughout the region. If you’re located in Riyadh, or any other surrounding community, Logistics Plus is ready to provide you with local, domestic, and global transportation and logistics services. Additionally, we’ll show you how our people put the “plus” in Logistics Plus by doing the big things properly, and the countless little things, that together ensure complete customer satisfaction and success! Contact us to learn more about Logistics Plus services in Saudi Arabia.